Cockcroft director Peter Ratoff welcomes the participants. 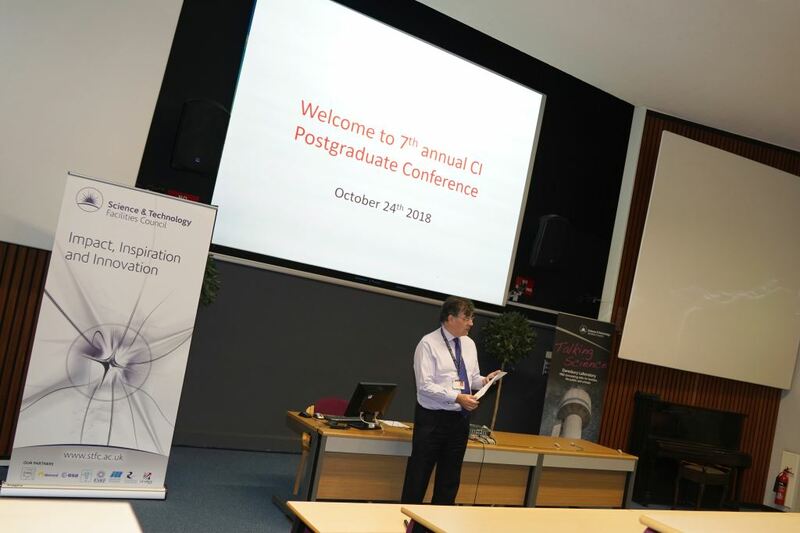 24th October 2018 saw the 7th annual CI Postgraduate Conference, which was held in our own Merrison Lecture Theatre on the Daresbury Science and Technology Campus. 36 of our postgraduates and academics attended from all four of the Cockcroft universities (Lancaster, Liverpool, Manchester and Strathclyde) and from the Accelerator Science and Technology Centre (ASTeC). Peter Ratoff – our director – gave an opening speech welcoming the participants and highlighting the importance of effective presentations for career development in academia and beyond; Dr Andrew Vick then talked about the role of ASTeC has in supporting the development of Cockcroft researchers. For the rest of the day, 15 of our current postgraduates gave presentations covering the wide variety of research activities going on in the institute. A judging committee made up of our academics and staff researchers marked each presentation based on their presentation style, technical contents, research context and question handling; the overall quality of the presentations was very high as Peter Ratoff mentioned in his closing remarks. First prize was given to Jenny Morgan from the University of Strathclyde for her presentation on “Generating Orbital Angular Momentum in a Free-Electron Laser”. The runner-up prize was shared between Victor Chang from Imperial College London (“Photocathodes for the Next Generation of Free-Electron Lasers”) and Amir Salehilashkajani from the University of Liverpool (“Developing a Supersonic Gas-Jet Based Beam Profile Monitor”). In addition to the presentations a poster session was held, and best poster prize was given to Kay Dewhurst (University of Manchester). After the work of the day, our postgraduates wound down with a game of laser tag (appropriately!) at Warrington Quasar. Our Postgraduate Conference is an important annual event for all our postgraduates and it provides a platform for them to network and present research results to their peers and to more experienced academics.